Elizabeth David writes lyrically in ‘A Book of Mediterranean Food’ and in ‘French Provincial Cooking’ of the Provencal Onion Tart; a dish much favoured by the French where it is called Pissaldiere. When in Nice recently I was delighted to find it is still being sold from hot iron trays at the Flower Market as described by David in her books. 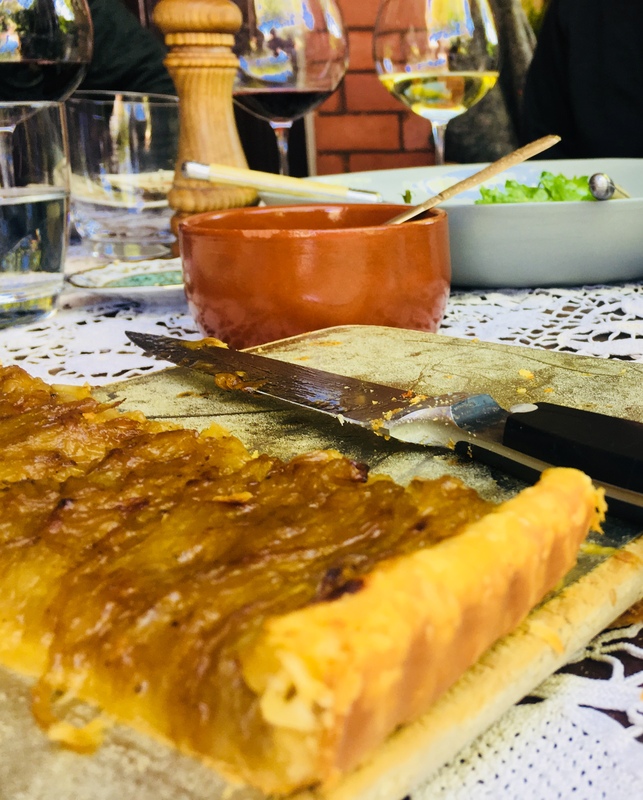 This tart of deliciously sweet onion puree often comes adorned with criss-cross designs of anchovies and olives; the idea of which could be ‘a little too hectic’ for some, as suggested my daughter Anna. In this recipe therefore I took the advice of the woman we bought our slices of Pissaldiere from. Rather than garnish with anchovies, the anchovy fillets are melted into the onions at the beginning of cooking. They render just enough salt seasoning to the onions without challenging those who don’t care for anchovies. They don’t even need to know about it. There is no adornment required and really the Pissaldiere is a classic example of the ability of the French to leave things alone and not load a dish with a squillion flavours and textures just because you happen to have them to hand. I use a shortcrust pastry and cook the Pissaldiere in a tin baking tray with a removable base and fluted edges - 20 x 30cm. While It is remarkably easy to make your own pastry, and i have given a recipe here, most people find this hard to believe. I must say that I often find myself reaching for a packet of Careme brand of unsweetened short crust pastry and keeping a handy stash of such in my freezer. This is an excellent luncheon dish or something light to serve in the evening. It is very easy to make and quiet beautiful. A simple salad of an assortment of the freshest spring leaves and edible flowers, carefully tossed in a vinaigrette dressing, and a bottle of beaujolais are about all else that you need. Elizabeth David writes lyrically in ‘A Book of Mediterranean Food’ and in ‘French Provincial Cooking’ of the Provencal Onion Tart; a dish much favoured by the French where it is called Pissaldiere. When in Nice recently I was delighted to find it is still being sold from hot iron trays at the Flower Market as described by David in her books. This tart of deliciously sweet onion puree often comes adorned with criss-cross designs of anchovies and olives; the idea of which could be ‘a little too hectic’ for some, as suggested my daughter Anna. In this recipe therefore I took the advice of the woman we bought our slices of Pissaldiere from. Rather than garnish with anchovies, the anchovy fillets are melted into the onions at the beginning of cooking. They render just enough salt seasoning to the onions without challenging those who don’t care for anchovies. They don’t even need to know about it. There is no adornment required and really the Pissaldiere is a classic example of the ability of the French to leave things alone and not load a dish with a squillion flavours and textures just because you happen to have them to hand. I use a shortcrust pastry and cook the Pissaldiere in a tin baking tray with a removable base and fluted edges – 20 x 30cm. While It is remarkably easy to make your own pastry, and I have given a recipe here, most people find this hard to believe. I must say that I often find myself reaching for a packet of Careme brand of unsweetened short crust pastry and keeping a handy stash of such in my freezer. This is an excellent luncheon dish or something light to serve in the evening. It is very easy to make and quiet beautiful. A simple salad of an assortment of the freshest spring leaves and edible flowers, carefully tossed in a vinaigrette dressing, and a bottle of beaujolais are about all else that you need. Pepper to season and a little salt to taste. Place a large saute pan over moderate heat, add the olive oil and the anchovies. Using a wooden spoon, break down the anchovies and allow them to disintegrate into the oil. Add the sliced onions, stirring to combine them with the anchovies – which will continue to break down during cooking – disappearing all together in fact. Season the ingredients with a little pepper. Stir well, cover with a firm fitting lid and keep over low to moderate heat. Remove the lid from the pan every 10 -15 minutes to stir the ingredients. Do not let the onions stick to the bottom of the pan or burn. It is important that the onions just melt into a puree they should not colour until towards the end of cooking. Continue cooking for a total of 50 – 60 minutes. Check the seasoning of salt and pepper. Once the onions are a soft puree, if there is a lot of liquid in the pan, remove the lid and stir while cooking a little longer to reduce most of the liquid. Too much liquid will prevent you from cooking a lovely crisp pastry. Sieve the flour onto a clean surface, mix in the salt and crumble the butter into it, add the iced water, a little at a time to form a ball of dough. This pastry does not need to be kneaded or to rest – it is ready to use. Lightly flour a surface and a rolling pin and roll the pastry into about a .25cm thickness..
To prepare the pastry tray, grease it lightly with butter and dust with a little flour, shaking off any excess. Drape the rolled pastry over the baking tray and drop it into place, pressing lightly as you do so, using your knuckles. If you do not have a rolling pin, simple tear off pieces of pastry, flatten them and press them into place, covering all of the base and sides of the pan. Lay the pastry sheet flat, lightly dust with flour and roll to thin it a little but the 1/4cm thickness of the Careme sheets is about right. Lightly grease the the pastry tray and the edges with a little butter. Dust with flour and shake off any excess. Place the pastry over the baking tray and let it drop into the pan. Using your knuckles, gently press the dough into the edges of the pan. Trim the excess pastry from the top of the edges – either trimming it with a knife or by simply pressing it into the metal and allowing it to drop away. Use a fork to gently press into all of the edges all of the way around. Prick the flat surface evenly with a fork. Gently spoon the prepared onion mixture onto the raw pastry base. Smooth it flat with a palette knife, taking care to fill all of the corners. Place in the preheated oven and cook for 10 minutes. Check the dish, turn it and cook for another 10 minutes. By now the pastry should be cooked golden and the onions coloured on top. Remove the dish from the oven and place on a wire rack for a further 10 minutes. If your tray has a removable base, place the base directly onto a cutting board. If you have cooked in a dish without a removable base, simply serve the Pissaldiere directly from the dish. Place the board or dish on the centre of the table and using a medium size knife, cut into portions and serve each person using a spatula.